After reading this you'll want to make this new superfood a part of your diet. Quinoa (pronounced ‘keen-wah’) is having a moment right now. In fact, the United Nations General Assembly even declared 2013 as the ‘International Year of Quinoa’. And we’re still loving it. Well, it’s starting to be called a ‘superfood’ and is about to become your go-to ingredient if you’re looking to lose weight because it’s extremely rich in complete protein and complex carbs. In fact, quinoa contains so much protein that the World Health Organisation equates the protein levels in quinoa to the amount found in milk. These are all essential for building and maintaining healthy bones and teeth, releasing energy steadily, reducing cholesterol and preventing disease. Sounds good, right? Well the plus points don’t stop there. 1. Wash the quinoa thoroughly then place in a saucepan with 360ml of cold water, bring to the boil then reduce the heat and simmer gently for 10 minutes. 2. Add the asparagus to pan with the quinoa in and continue to cook for 5mins or until the asparagus is tender and all the water has been absorbed. Set aside to cool. 3. 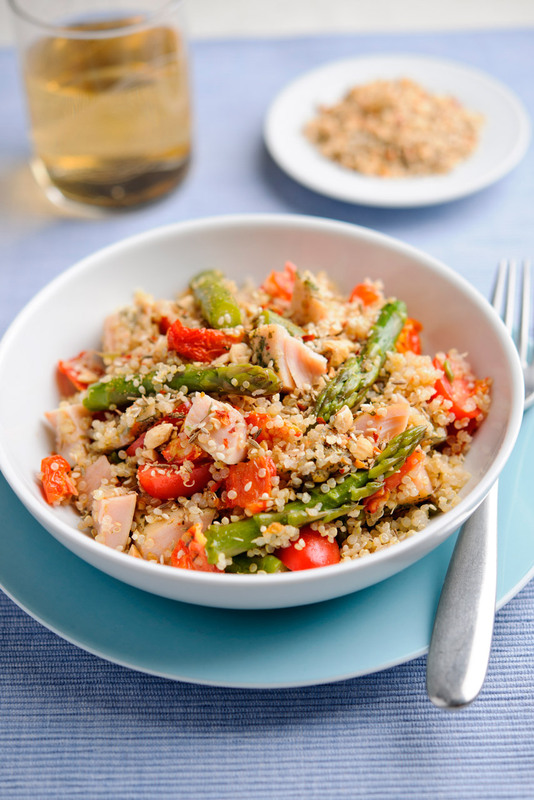 Transfer the quinoa and asparagus into a large bowl. Stir in the chicken, fresh and sunblush tomatoes. Dukkah is an Egyptian spice mix made from a blend of nuts and seeds and spices. It is available in Marks & Spencer or you can make it. 1. Dry fry the sesame seeds, cumin and coriander for 3 minutes, in a non stick frying pan over a low heat, moving them about until they start to smell fragrant. Tip them out onto a plate. 2. Add the hazelnuts to the frying pan and fry for 1-2 minutes or until lightly golden. Stir the nuts, salt and chilli into seed mixture. 3. Store in an airtight container for up to 1 week. 1.Heat the oil in a large pan over a medium heat, add the onions & fry for 5 minutes or until soft. 2.Add the chicken and fry for 1 minute until lightly browned. 3.Stir in the balti paste and quinoa, fry for 2 minutes. 4.Stir in the tomatoes and stock, simmer for 20 minutes until the quinoa is soft and cooked. 5.Stir in the cashews, most of the coriander and season to taste. 6.Garnish with the rest of the coriander to serve. Fiona Hunter is a nutrionist and food writer, visit her website for more information. 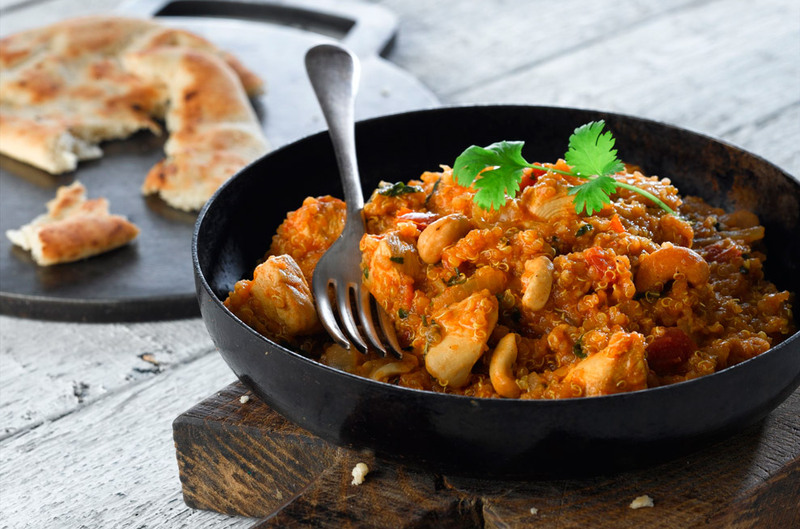 The chicken balti recipe was provided by Whitworths, the UK’s leading supplier of dried fruit, nuts and seeds, including quinoa. The salad recipe was provided by British Asparagus.